(CNN) -- The chairman of one of India's fastest-growing banks, the sister of a Bollywood actor, a Times of India journalist and the chief of India's Anti-Terrorism Squad were among Indians killed in the four-day terrorist siege in Mumbai. 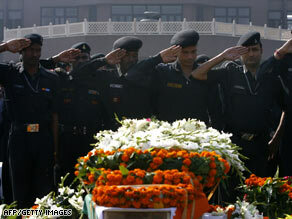 National Security Guard troops salute slain commando Gajendra Singh on Saturday in New Delhi, India. Eighteen foreigners, including five Americans, were killed in attacks on nine sites Wednesday through Saturday in India's commercial capital; at least 165 Indians died. Several news outlets reported that Ashok Kapur, chairman of Yes Bank, was killed Wednesday at the Oberoi hotel. He had gone there to have dinner with his wife and some friends, who escaped the carnage, the Indian newspaper Business Standard reported. His body was found not in the restaurant but on the hotel's 19th floor, a bank spokesperson told the paper. Kapur was one of the founders of the bank and held a 12 percent stake in it, Business Standard said. His long banking career included ventures in Singapore and the Netherlands, and he was an adviser to India's wealthy Tata family, the paper reported. Bollywood actor Ashish Chowdhury's sister, Monica Chhabaria, and her husband also were killed Wednesday at the Oberoi, CNN-IBN reported. The actor waited outside the hotel for word of his sister, who he said had stopped answering phone calls after the siege began. Chowdhury has appeared in numerous Indian films. The body of Sabina Sehgal Saikia, a Times of India consulting editor and food critic, was recovered Saturday from the Taj hotel, CNN-IBN reported. As the terrorists were seizing control of the hotel, Saikia had sent a text message to hotel employees saying, ''They are in my bathroom,'' CNN-IBN said. She was not heard from again. Hotel staff were also among the many dead. Boris Rego, a management trainee at the Taj Mahal hotel, was killed Thursday, his brother told CNN-IBN. Kevin Rego said his 25-year-old brother was working in the hotel's restaurant when gunmen barged in and opened fire. Boris made several phone calls to his family in Goa, the last one coming in about 2:30 p.m. Thursday, Kevin Rego told CNN-IBN. "There was commotion in the background. All he said was 'Daddy ... Kevin ... Kevin.' Then his voice trailed off, and there was silence," his brother said. The chairman of the company that owns the Taj told said the hotel's general manager lost his family in a fire the broke out in the hotel Wednesday night. "I went up to him today, and he said, 'Sir, we are going to beat this. We are going to build this Taj back into what it was,' " Tata Group Chairman Ratan Tata told CNN's Fareed Zakaria. The bodies of Karambir Kang's wife and two children of were burned beyond recognition in the fire, The Times of India reported, citing hotel sources, but it was unclear whether they were killed in the blaze. Thousands turned out Saturday in Mumbai for the funeral of Hemant Karkare, chief of Maharashtra state's Anti-Terrorism Squad, who was shot to death Wednesday as the siege unfolded. He was one of at least 17 police officers who died in the attacks. Karkare's cremation was delayed while his two daughters made their way home from the United States and England, The Times of India reported. The body of another Security Guard officer, Gajendra Singh, was taken to New Delhi before being transported for last rights in his native Dehradun, The Times reported. He was killed at Mumbai's Chabad House, a Jewish community center where American-born rabbi Gavriel Noach Holtzberg and his Israeli wife, Rivka, were killed along with another American rabbi, Leibish Teitelbaum.